Am I required to attend SOS? Can I bring my parents and/or guests? You are not required to attend SOS, but students who do not attend SOS for any reason will not be allowed to register for classes until two days before the term starts, at which time it will be very difficult to obtain a schedule of classes applicable to your major. Attending SOS is highly advantageous for incoming students. Parents and other guests are also invited to attend SOS. There is a separate program designed specifically for them, and an additional fee of $50 per guest will be charged to your account. The parent/guest program is for family members interested in learning about Auburn. Incoming Auburn students are the only people permitted to attend the student program. Your friends should not plan to attend SOS with you unless they are also entering students and registered for that SOS session. 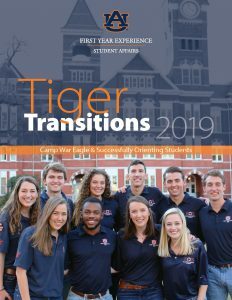 I’m a transfer student; why do I need to attend Auburn’s orientation? How much does SOS cost? The SOS student registration fee is $100. Your fee will be charged directly to your online student billing account (otherwise known as your eBill), therefore please do not send money to our office to cover this cost. This fee includes breakfast, lunch, program materials, and a t-shirt. Parents and guests of incoming Auburn transfer students are also invited to attend SOS. Parents and guests will participate in their own, separate program that is designed specifically for them. An additional fee of $50 will be charged per guest. This guest fee will be charged to the student’s online billing account (eBill) as well and will include breakfast, lunch, and program materials. The parent/guest program is designed for family members interested in learning about Auburn. Please note that the SOS student and guest registration fees are non-refundable. Is there any benefit to coming to orientation earlier? YES! The sooner you attend SOS, the earlier you will be able to begin registering for classes. Class selection reduces each session as more current and new transfer students register for their classes. It is also helpful to have more time to register and adjust your schedule since some of your transfer course work may still be in process. Students who wait until the August or January SOS session may struggle to obtain full-time hours. What if my plans change and I need to change my session? If you need to change your session, please contact our office at 334-844-4501 between 7:45 am-4:45 pm Central Time. We will work to find another available session. Please note there is a $15 fee to change your session. Do I need to submit a medical form? How? Upon acceptance to Auburn, you are placed on hold by the AU Medical Clinic until your submission of the required Medical Information Form. The Medical Information Form uses the Med+Proctor system. Go to auburn.edu/medicalform to set up an account for the Med+Proctor system and to get the form. You should do this as soon as possible to clear this hold permanently. If you are unable to complete the form by your SOS session, you can complete an electronic Letter of Understanding (LOU) to clear your medical hold temporarily. You may access the LOU in AU Access (“My Academics” tab, then click the “Student Menu” icon, then the “Temporary Waiver of Medical Hold” link). Completion of the electronic LOU will grant you a temporary exception to the medical hold so you can register for classes once your time ticket opens. You will have 30 days after your SOS session until the medical hold is placed back on your account. If you have any questions concerning the form, please call the AU Medical Clinic at (334) 844-4416. How do I verify receipt of my transcript? If you are a transfer student, you must speak with the Admissions Transfer Specialist or another Admissions Advisor to verify receipt of your transcript in the Admissions Office. The Admissions Transfer Specialist may be reached at 334-844-6441. When will I receive details about my SOS session? Immediately after registering for your session, you will receive a registration confirmation in your Auburn Tigermail email inbox. After you register, you will receive a confirmation letter, campus map, parking pass, and parking instructions through the mail. A week before your session date, you will receive an email to your Auburn account with specific information regarding your session. In the meantime, we also encourage you to download Auburn Guides, a mobile app containing the SOS schedule and other resources. To download the app, visit the App Store/Google Play, or go to guidebook.com/g/auburnsos18. Blackberry and Windows phone users may visit the mobile website at guidebook.com/guide/105292. Does scheduling my SOS session affect my ability to get football tickets? Per Auburn University Athletics Department policy, if you have earned no credit hours from Auburn (not transfer credits), you will only be able to order football tickets if you have a fall semester schedule in place. If you do not meet the March 1 Priority Registration Deadline (see Class Registration Information), the only way to have a fall schedule in place is to attend SOS in the spring. Transfer students who do not attend one of the four SOS sessions in the spring will not be allowed to register for classes until August 14 SOS session. By that point, football tickets are usually sold out. If you are interested in football tickets, we highly encourage you to attend either a SOS session in the spring or meet the Priority Registration deadline. What should I bring to my SOS session? What should I wear? Students and guests attending SOS should wear comfortable clothes and shoes, or clothing that is appropriate for walking. Students and guests should also prepare for inclement weather by bringing umbrellas or rain jackets. Students should also be sure to bring their drivers licenses or another form of picture ID in order to have their student ID card made. Check-in is in the Auburn University Student Center from 7:45 am-8:15 am. Please plan to arrive a little before this to allow time to park and get to the Student Center. More information about session specific directions from the parking location will be included in an email to the student’s Auburn email address a week before the session. Where do I park on the day of SOS? Parking for SOS varies by session so click here for more information. All new students attending SOS will receive a guest parking pass for their session in their confirmation packet. If you did not receive a parking pass, SOS Staff will have some in the parking lot before check in. What do I need to do if I need an accommodation? Please notify our office as early as possible if you have specific dietary needs, physical limitations or other concerns that may affect your orientation day. We also encourage you to contact the Office of Accessibility at 334-844-2096 (V/TTY) to register your accommodation needs. Students who require accommodations are encouraged to notify the SOS Staff as early as possible to allow adequate time for accommodations to be made. This includes mobility concerns, dietary needs, health conditions or communication needs. Should I schedule an appointment with my advisor before SOS? No. There will be a designated time during your SOS session to speak with your academic advisor and learn general information about your specific college or school, discuss your major’s requirements, and begin to review your transfer credits. If you have more questions than can be answered during SOS, you can schedule a meeting with your advisor after SOS. How do I print my AGSC Transfer Agreement? If you are transferring from an Alabama two-year or four-year institution, print a copy of your AGSC Transfer Agreement by accessing stars.troy.edu and clicking on the AGSC Transfer Guide link. Bring this form with you to SOS. Do I need to take a Math Placement Test? Can I change my major before SOS? How? You may request a major change before SOS. If you met the Priority Registration Deadline(March 1 - students starting in the summer/fall, October 1 - students starting in the spring), please contact the college of your new desired major so an advisor can change your major. Phone numbers for each college can be found here. Please note that if you change your major after the Priority Registration Deadline, the registered scheduled will not be changed by your advisor. You will be responsible for making any schedule changes once your time ticket opens after SOS. If you did not meet the Priority Registration Deadline, please call the Office of Admissions Processing at (334) 844-6429 so they can change your major. Please make all major change requests as soon as possible so your advisors have as much time as possible to review your information. Do the students and parents/guests go through SOS together? If not, when will we see each other? All other sessions throughout the day are designed specifically for students or parents and guests separately.